When things go wrong, it is easy to point fingers at others, when the problem is really within. These four points are all connected to not knowing when to keep quiet. 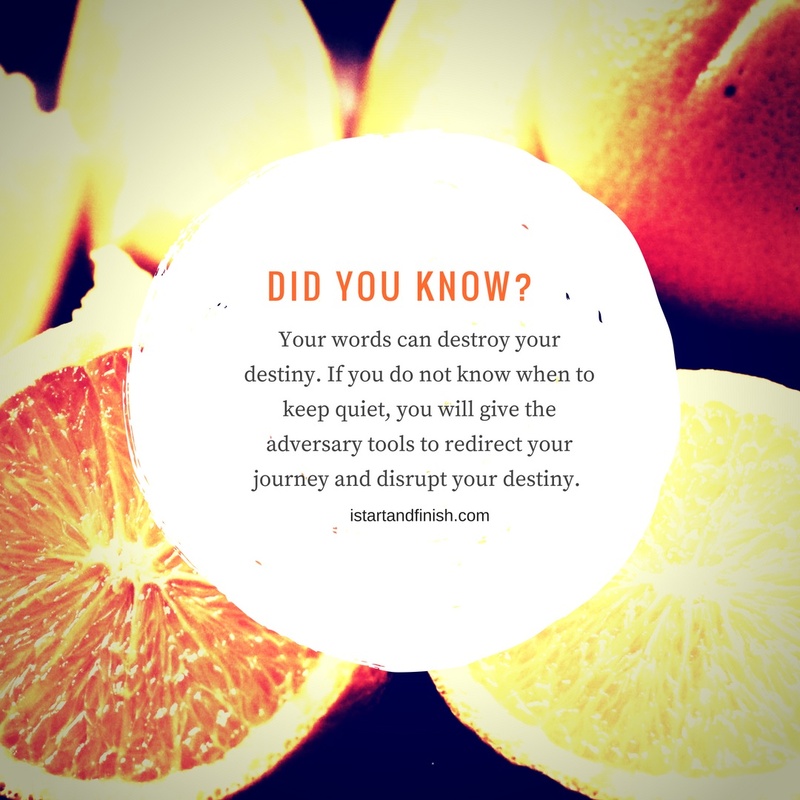 Do you know that your tongue can halt your destiny? If you talk too much, cannot control yourself and reveal every step you take, you are “like a city whose walls are broken down” (Proverbs 25:28). A city without walls is “open sesame” for enemy attacks. That is, you have given free and unrestricted access to the adversary of our souls to enter your life and use as his stomping ground. Some operations you have to carry out quietly and without any fanfare. When Nehemiah got to Jerusalem, it was after he had stayed there for three days that he slipped out during the night with a few men (Nehemiah 2:11-12) to survey [examine] the land. He did not tell anyone what God had placed in his heart. They did not announce their arrival either. When God reveals something to you, don’t rush off seeking answers from everyone. When God revealed Christ to Paul, Paul didn’t “confer with flesh and blood [did not consult or counsel with any frail human being or communicate with anyone]” (Galatians 1:16 AMP) or go to those who were apostles before him. Instead he retired into the deserts of Arabia, came back to Damascus and met with Peter in Jerusalem three years later. Sometimes the enemy operates with the information you share. What about familiar spirits? Listen: “wizards..peep and..mutter” (Isaiah 8:19). To peep means to see through a small opening. You share a little that becomes manipulated to misdirect your journey and halt your destiny. Don’t fall for the enemy’s tricks. Discern spirits because some folks only connect with you to steal from you. There isa time to share and there is a time to keep quiet. These are some points that can disrupt destinies. Which other point can you add to the list? I would love to hear from you. Please post your comment below. Thank you very much for this great devotional. At the moment I am looking for a new Job and I very urgently need a breakthrough (for financial reasons). I really don’t know why there is no breakthrough. Can you give me some advice what I should do? I am a born-again Christian. You are welcome. I pray that your job is released to you and unemployment cancelled in Jesus name. You will find my book helpful – “The Bilhah Moment: How to Wait on God in Desperate Times.” Click here for details. Also, we have articles that would be beneficial to you at persistentfaith.com. God bless you.